Creates a cylindrical mesh, created around a series of X, Y and Z positions which are defined by 3 different functions. The functions can be easily changed using 7 variables (Segments, M, N, P, Q, H and T) which are all spinners. There is a editor to more easily view and edit the functions, and a preset editor, which allows you to save settings for later use. The mesh can be manipulated, with twisting and scaling of the radius (The radius can be changed using a regular, distance, or custom function. The tube can be rotated and twisted (with a bias)). A Spline can be created following the same functions. For the function to rotate one vector around another. For the basic idea, and presets. 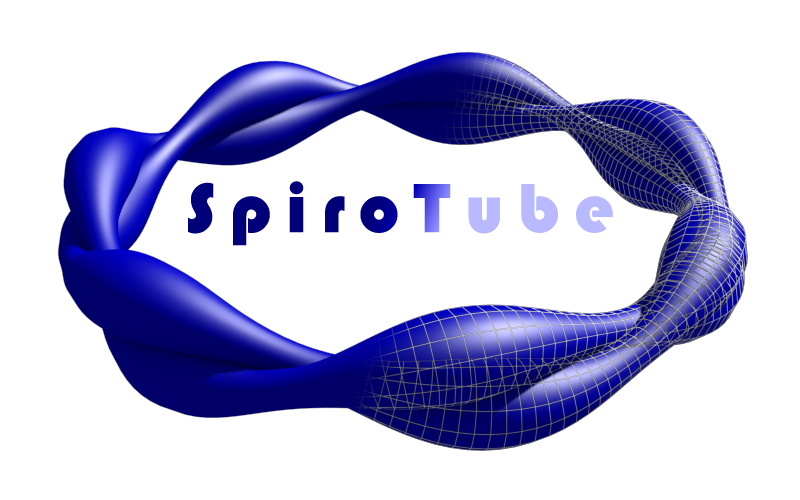 Copy the file to "C:\Program Files\Autodesk\3ds Max 20??\scripts\Startup\SpiroTube.ms". Presets and preset editor changed. Distance option added for radius change. Radius change now has a overall effect value, and the option to use none of the 3 options. Moved plugin to "Extended primitives" section. Added option to use the closet edge for the faces connecting start/end, when using twist this can fix twisted faces at the end. Changed a few other things. Added preset saver, and editor. Bias now works with negative values. when re-loading a scene, the selected preset doesnt change values. Added boxes(colorpickers) to each side of the x,y,z positions, to notify user of errors within the functions. Video below is not up to date. Submitted by lantlant on Mon, 2013-06-17 10:44. Submitted by brttd on Tue, 2013-06-11 06:11. Now has the option to use the closet edge when connecting start/end(only useful when using twist). Unless someone has a suggestion, I wont be updating this for a while, but it will (hopefully) be optimized, especially in the preset editing part. Submitted by notapix on Thu, 2013-06-06 03:35. Submitted by lantlant on Thu, 2013-06-06 03:33. Submitted by brttd on Wed, 2013-06-05 12:40. Thanks, I am working on a way to save/edit presets, should be done soon. Not perfect, I will have to make a few changes to it in the future, but it works. When saving/editing presets, you need to reload the variables rollout(deselect and re-select the object) before the list of presets updates. If no presets are there(which is true when first loading) it gets the default ones, and uses them(these can be edited and deleted). Submitted by notapix on Wed, 2013-06-05 07:51. Submitted by notapix on Wed, 2013-06-05 07:13.
script works for my max2008 32bit. is it possible add a function "save preset"(or parameter)? Submitted by brttd on Wed, 2013-06-05 05:12. I have made a small(ish) update. Bias now works with negative, reloading a scene now no-longer resets the values to a preset, and there is also a notification when a function doesnt work. Submitted by luxxeon on Tue, 2013-06-04 18:20. Excellent script. Makes it really easy to create a lot of interesting algebraic geometry, and explore mathematical functions. Well done. Keep it up.